"Centuries old and enjoyed by tens of millions of people worldwide, golf is seen by many as more than a sport. Yet what do we know about the other person on the course? The man or woman behind the player carrying the bag. In a narrative never before covered in any feature length documentary,Loopers: The Caddie's Long Walkexplores the incredible personal bond that a golfer and a caddie develop through hours of time together. It is often said that a good caddie does three things: show up, keep up and shut up. But a great caddie wears many hats. They’re the player’s psychologist, mother/father figure, technical advisor and confidante. The film unveils the working dynamic between famous partnerships like the heartfelt story of Tom Watson’s and caddie Bruce Edwards. Conversely, it delves into the making of a caddie’s career with stories like Greg Puga — a young Bel Air Caddie from East Los Angeles who fought his way to Augusta to play in the Masters as a Mid-Amateur Champ. Whether familiar or new, these are stories that will make you re-think the way you look at Golf, and especially the job of the Caddie. 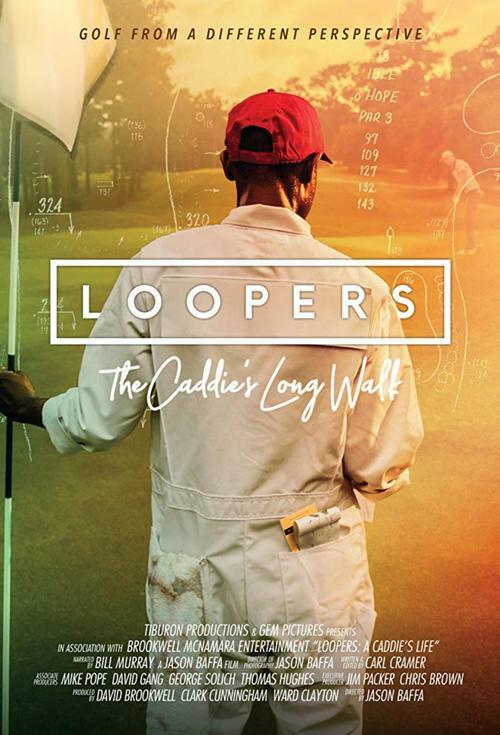 Loopers: The Caddie's Long Walkis a visual tour de force shot on the iconic courses of Pebble Beach, Augusta National, St. Andrews, Carnoustie, Prestwick, Ballybunion, and Lahinch. Crafted in the spirit of documentaries like “20 feet from Stardom”, “Jiro Dreams of Sushi” and “Step into Liquid”, the film is a must-watch document of the game of golf as you’ve never seen it before."